As the amount of alcohol you’re legally allowed to consume before driving a car drops ever lower, it seems that every mainstream brewery in New Zealand is releasing its own low- or mid-strength beer. First it was DB Export Citrus – the beer that tastes like a cross between Lift lemon soft drink and a sickly sweet RTD – then Monteith’s and Mac’s released the beers that I’m going to review here, and even Heineken released Heineken Light earlier this year (if only I had a dollar for every billboard I’ve seen around Auckland advertising that stuff…). But where Heineken Light and DB Export Citrus market themselves as “light beers”, Mac’s Mid Vicious and Monteith’s Mid Strength Ale position themselves as “mid-strength” beers, which presumably means they’re a bit more flavourful than the lighter ones? They say: Monteith’s Mid Strength Ale is a rich full-bodied beer that is brewed using a blend of five different malts to deliver a full rounded caramel flavour. It has light hop aroma characters and a mild bitterness to balance the beer and provide a long aftertaste. They say: Like a rockstar with a day job, this Session Pale Ale keeps its hoppy flavour blaring, but cuts the alcohol content in half. This brew definitely gets its fans cheering. Okay, so the marketing teams behind both of these beers have decided to focus on the flavour of their respective mid-strength beer. That’s fine by me, because what’s the point of drinking a lower alcohol beer if it tastes like crap? You’d be better off not drinking anything at all. First of all, I think whoever wrote those tasting notes for Monteith’s either has the best pallet in the world or has the worst. It just tastes like a watered-down Monteith’s Original to me. I think describing its “full-rounded caramel” flavour is a bit strong, too, and the hop aroma characters must be very light indeed. And yet, as a weaker, watered-down version of Monteith’s Original ale, it’s not that bad. I’d certainly prefer it to DB Export Citrus or Heineken Light. As for Mac’s Mid Vicious, well, I must say I was very disappointed. Whereas I don’t expect much from Monteith’s, I’m actually a fan of both Mac’s Green Beret IPA and its Three Wolves pale ale, which are great cheap and cheerful alternatives to just about every other mainstream domestic beer in New Zealand. However, drinking Mac’s Mid Vicious session pale ale was like drinking a cup of water from a glass that you haven’t properly rinsed after drinking a beer in some time before. To be fair, perhaps I was expecting too much. Here I was assuming that Mac’s would make it work on a budget (none of its beers are the best in the world but they’re pretty good in their price bracket). Instead, this beer is as bland as a very bland thing. Still, in comparison to the Monteith’s Mid Strength Ale, Mac’s Mid Vicious does pretty well – especially considering it has a half a percent less alcohol. I guess I’m just disappointed because I expected more than a pale imitation of an average beer. So, which beer is better? The Mid Strength Ale from Monteith’s? Or the disappointing Mid Vicious from Mac’s? Frankly, I don’t think either is much better than the other, and let’s be honest – you probably aren’t likely to pick up either one of these beers unless you’ve got to drive afterwards. Which has got me thinking – why are we so desperate to drink a beer before we drive somewhere? Surely we’re better off having a good beer when we get to our final destination, or savouring one good beer (factoring in time and a full stomach so that we know we’re okay to drive after), than merely settling for a crappy beer that tastes mostly of water. 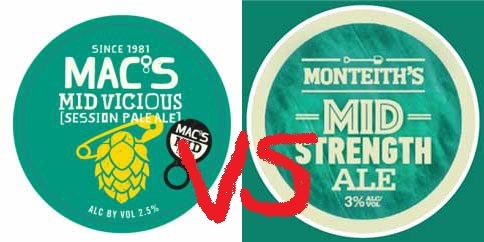 But if you have to drink a low-alcohol beer, you could do worse than drink a Mac’s Mid Vicious or a Monteith’s Mid Ale. You could always have a Heineken Light.